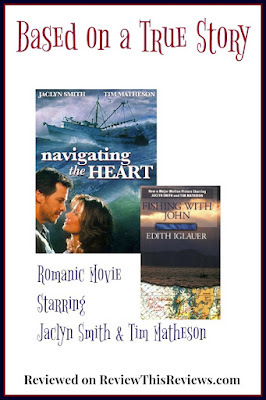 The movie Navigating The Heart starring Jaclyn Smith and Tim Matheson was actually released in 2000. However, I only discovered it this week. I love it when I find two of my favorite actors in a old movie that I have never seen before. I know I am guaranteed a wonderful movie experience. I was certainly not disappointed with this one. Navigating The Heart is a great romantic movie where two people from completely different backgrounds fall in love. What makes this movie even better is that it is based on a true story. The book entitled "Fishing with John" was written by Edith Iglauer, the main female character in the story. She tells the story of their love and sadly brief life together in this bestselling memoir. The movie only captures the story of how they met and fell in love. For the details of their subsequent life on the boat, you would need to read the book. To be completely honest, if it were not based on a true story I would have a hard time believing a beautiful, sophisticated city woman would fall in love with a small town fisherman. 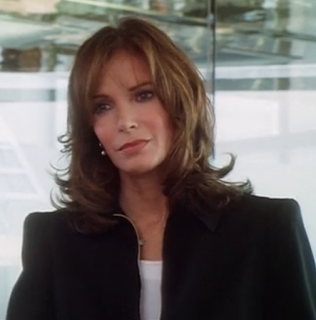 Normally, we would have to suspend reality to embrace this story, but not with Edith Iglauer (Jaclyn Smith) and John Daly (Tim Matheson). Edith Iglauer is a somewhat arrogant, although justifiably so, writer for Manhattan magazine, which has just been taken over by a new owner with very different ideas about how a magazine should run. Previously the "literary journalists" were allowed to choose their own article subjects. Now, they will be assigned. This decision to assign subjects and articles burns right to the core of Edith's literary heart. She is not happy about the idea and doesn't hesitate to express her opinion. She feels her 15 years of dedication, as well as her contribution to the popularity of Manhattan magazine, should be rewarded and praised. It is beneath her to be treated like an upstart that needs to be spoon-fed or assigned specific boring subjects to cover. Her first assignment is to write a piece about the excessive price of salmon. Needless to say, Edith is outraged at the idea. After all, her expertise is in covering politics. Interestingly enough, when she investigates the industry for her assignment, she does find a huge political influence. But she doesn't know that will be the case as she reluctantly heads to British Columbia, Canada to get background for her article. I had to laugh out loud when Edith arrived at the fishing pier dressed for the office, wearing toeless heels and pulling her luggage on wheels. It really is the perfect illustration of how out of place she was in a fishing town. After learning that John Daly is the best source of information for her article, Edith asks a local female fisherman to take her out to John's boat. He is no happier to see her there than she was to have been assigned the article. However, after some persuasion, he allows her onto his boat and proceeds with the business of catching, cleaning and icing fish. Needless to say, Edith is sickened by what she sees and smells. Again, I had to laugh when she quoted Mark Twain, "fishing is a jerk at one end of the line waiting for a jerk at the other end". Determined to write a story and not be beaten by this assignment, Edith ends up back on a John Daly's boat in spite of how much she really dislikes him. At constant odds with each other, while exchanging hateful barbs, Edith makes bad matters worse by accidentally starting a fire on the stove. Later that night, in the midst of a storm, they hit a log and the boat starts taking on water. Declaring "mayday" and requesting assistance, John does his best to seal of up holes, and then they wait. Ironically, it is during that time of waiting for help, possibly facing death, that they talk and a friendship is forged. Edith does write her story, but her whole life is changed after visiting BC, Canada, where she finds so much more than just content for a story. I had to chuckle a bit reading about Edith showing up to interview a fisherman on his boat wearing her city work clothes. Between her initial attitude about the assignment and John's reluctance to be interviewed, I can well imagine that sparks flew at first. This movie sounds like one I would enjoy. Thanks for your review, Sylvestermouse. Wow, does this ever sounds like a good movie. Based on a true story as well! That makes it a must to watch in my books. I'm curious now to find out more about how this unfolds. You had me from beginning to end on this review. by Edith Iglauer. They both sound like great reading and screening! Tank you for your reviews Cynthia! You've hooked me with this review, too, though I'm more inclined toward the book because I want the whole story and it's easier to read the book than watch the movie. One of these days we may get a smart TV so I can see Amazon movies from my recliner instead of sitting at my work desk. Can't do anything until I finish the taxes.